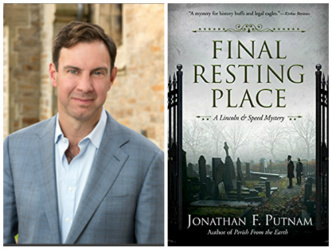 Please join us on Monday, February 25 at 6 pm to hear author Jonathan F. Putnam talk about his "Lincoln and Speed" mystery series. Jonathan presented at Copperfish Books in September 2018 and was very well received. He is kind enough to return "in season" to allow more folks a chance to hear his fascinating talk about his books, and about Abraham Lincoln and his times. In the first book, These Honored Dead, Joshua Speed, the enterprising second son of a wealthy plantation owner, has struck off on his own. But before long, he makes a surprising and crucial new acquaintance--a freshly minted lawyer by the name of Abraham Lincoln. When an orphaned girl from a neighboring town is found murdered and suspicion falls on her aunt, Speed makes it his mission to clear her good name. Of course, he'll need the legal expertise of his unusual new friend. "Jonathan Putnam combines an historian’s understanding of character and context with a remarkable narrative drive that kept me fascinated from start to finish." - Doris Kearns Goodwin, Pulitzer Prize winner; author, Team of Rivals. Jonathan Putnam is a writer and attorney. A graduate of Harvard College and Harvard Law School, he is a nationally renowned trial lawyer and a recognized Lincoln scholar. His Lincoln and Speed Mystery Series includes Final Resting Place, Perish from the Earth, and These Honored Dead. Twenty-nine-year-old Abraham Lincoln has spent his entire adult life running from his past--from the poverty of the dirt-floor log cabin where he was raised, from the dominion of his uneducated father, and from a failed early courtship. But now, Lincoln's past is racing back to haunt him.